Scarcely any biographers seem to have dealt seriously with Paganini as a guitarist. Judging by the technical difficulty of the works for guitar, the virtuosity that Niccolò Paganini had on the plucked instrument must have been similar to that which he demonstrated on the violin. 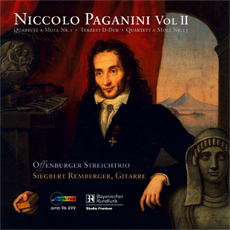 The present recording is of the first and last of Paganini’s 15 quartets for guitar, violin, viola, and violoncello as well as of the Trio for Guitar, Violin, and Violoncello, written in 1833. The Fifteenth Guitar Quartet in A Minor constitutes a special case in Paganini’s oeuvre, indeed in chamber music in general. The viola takes the lead, displacing the violin as the main voice, that gives this quartet a unique charm.